Frank G. Slocumb, 72, passed away at Edward Hospital in Naperville on Tuesday, January 9, 2018. A resident of Naperville for over 25 years, he is survived by his wife and soul mate of 45 years Mary Kay, loving son Jack, sisters Marguerite (Michael) Seymour and Catherine Slocumb, brothers-in-law Gerald (Natalie) Hilbrich and Charles (Leslie) Hilbrich, and many nieces and nephews. Frank was preceded in death by his parents Frank G. Sr. and Marguerite L. Slocumb. Frank grew up in Oak Park / River Forest, IL and attended Oak Park – River Forest High School. After graduating from Loyola University of Chicago in 1968, he was commissioned in the United States Army and was based at Ft. Meade in Maryland. Upon serving 27 months of active duty as a 1st Lieutenant and later receiving an honorable discharge as Captain, Frank went on to receive his MBA at Northwestern University. While there, he met his wife, Kay, and they were married in 1972. That same year, Frank was hired by BMO Harris Bank, and he would retire with the bank after 36 years with the title of District Executive. Frank and Kay welcomed their son, Jack, in 1986, and the family moved to Naperville in 1993. 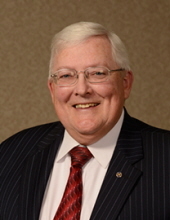 Frank served as President of Harris Bank Naperville and was active with many community-based organizations. His many leadership roles included past board member and Chairman of the Trustees of Edward Hospital, board of directors and past chair of the Naperville Development Partnership, advisory board for the Colbeth Clinic at the University of Illinois Medical Center, board member and past president of the Rotary Club of Naperville, board member of St. Patrick’s Residence in Naperville, board member of the Millennium Carillon Foundation of Naperville, founding board member of the Naperville Parks Foundation, board member of the Edward Foundation, and board member of Wheaton Bank and Trust Company. In addition, Frank was an active fund raiser for the above mentioned organizations, as well as the Naperville United Way, the Heritage YMCA, Boy Scouts of America, and often St. Raphael Church Capital Campaigns. During his life, Frank was honored with many awards and recognitions for his commitment to serving the Naperville community. Some of these awards include the inaugural Community Leadership Award from BMO Harris Bank, The United Way of Suburban Chicago Volunteer of the Year, Croagh Patrick Award for extraordinary kindness, generosity, and help to the Carmelite Sisters and Residents of St. Patrick’s Residence, Kid’s Best Friend Award presented by the Education Center, Lifetime Achievement Award from the Naperville area Chamber of Commerce, Distinguished Citizen’s Award from the Boy Scouts of America for exemplary personal commitment to the community and civic service, the Rotary Club of Naperville Lifetime Achievement Award, and the Art Davis Leadership Award presented by the Rotary Club of Naperville. Among his many hobbies, Frank was an avid sports fan, enjoyed attending the theater and Chicago Symphony, and spending time at his condo in downtown Chicago. Most of all, Frank enjoyed traveling around the world with Kay and playing golf with Jack. In lieu of flowers, donations can be made in Frank’s name to the Edward Foundation for the Edward Cancer Center, St. Patrick’s Residence in Naperville, or the Rotary Foundation. Visitations will take place on Monday, January 15 and Tuesday, January 16 from 3-8 pm at Friedrich-Jones Funeral Home, 44 S. Mill St. Naperville, IL 60540. Frank’s life will be celebrated with a Mass of Christian Burial on Wednesday, January 17 at 10:30 am at St. Raphael Catholic Church in Naperville, IL. Interment will follow the mass at Assumption Cemetery in Wheaton, IL. To send flowers or a remembrance gift to the family of Frank G. Slocumb, please visit our Tribute Store. "Email Address" would like to share the life celebration of Frank G. Slocumb. Click on the "link" to go to share a favorite memory or leave a condolence message for the family.